Salmon is full of healthy fats and takes well to just about any flavor combination. Place salmon (skin side down) on parchment-lined or non-stick baking sheet/uncovered baking dish. In small bowl, mix olive oil, butter or buttery spread with parsley, lemon zest, garlic, salt, pepper and nuts. Spoon evenly over salmon filet (discard any extra mixture). 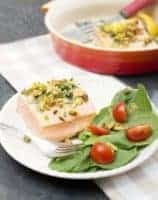 Bake salmon 8 to 12 minutes, until buttery spread has completely melted and nuts are beginning to toast. Salmon should flake apart easily with a fork. For more flavor, add sliced lemons to baking sheet or dish while cooking. Remove from oven and garnish with more parsley if desired. Serve hot with salad, quinoa or another healthy side.